On Sunday, Urban Patchwork Neighborhood Farms and Slow Food Austin teamed up on a tour of four neighborhood farms in the North Central Austin. 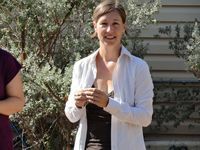 Urban Patchwork (UP) was started in 2009 by Paige Hill (see photo). 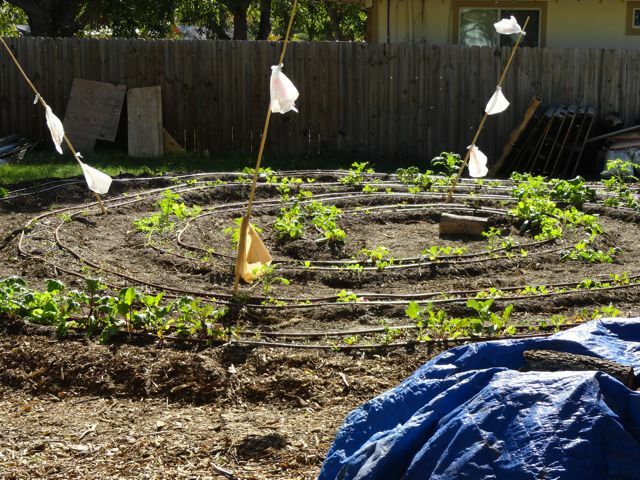 It partners with homes around the North Central Austin area to grow vegetables and eggs for its members, and in the process teaching members how to grow food in the city. UP currently operates farms in three neighborhoods: Crestview, Wooten, and Cherrywood. The tour started at the first urban farm on Duval where we were introduced to the Urban Patchwork team, given a map of the other three farm locations, and sent on our way to tour the other sites. The four farms on the tour were close enough to ride a bike to but not to walk. Fortunately, the weather was good, a little warm for a mid-November day but suitable for the outdoor event. 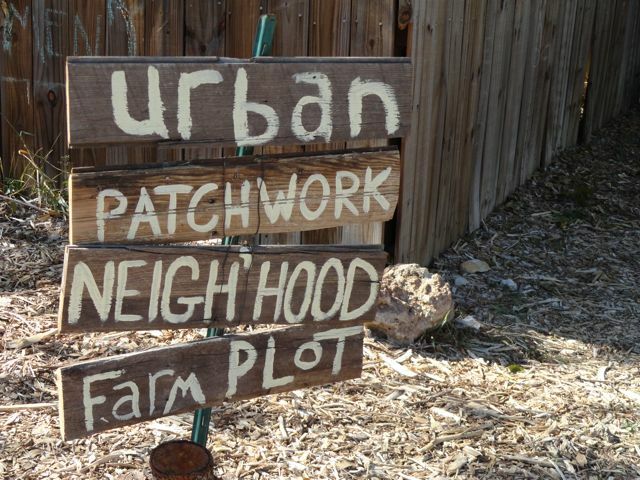 Urban farms are people's yards, complete with compost piles, chickens and gardening tools. Two of the farms had plots in the front yard. At first glance, it just looks like a big garden. However, what you learn on the tour is these gardens are carefully designed food production systems built and maintained by a community of evolving urban farmers that draw on the experience and knowledge and support of Urban Patchwork. And why not an urban farm? I'd rather spend money on water for something I can grow to eat. St. Augustine be gone! Now before you get out the tiller, be prepared. The one thing I came away from on the 2 1/2 hour tour is a deeper appreciation for the thought and work involved in farming, even if it is on a relatively small plot. There are many facets to it. You may want to start with a simple backyard garden to get your hands dirty before turning it into a farm. Farming efficiently is all about getting the nutrients that plants need to grow human food and converting the scraps back to plant food all the while letting nature do as much of the work as possible. 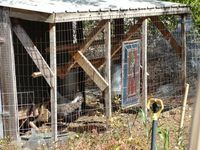 For example, having chickens are a great source for fresh eggs but they also contribute to the health of a garden by rooting out grass and weeds, eating insects, and fertilizing the soil. 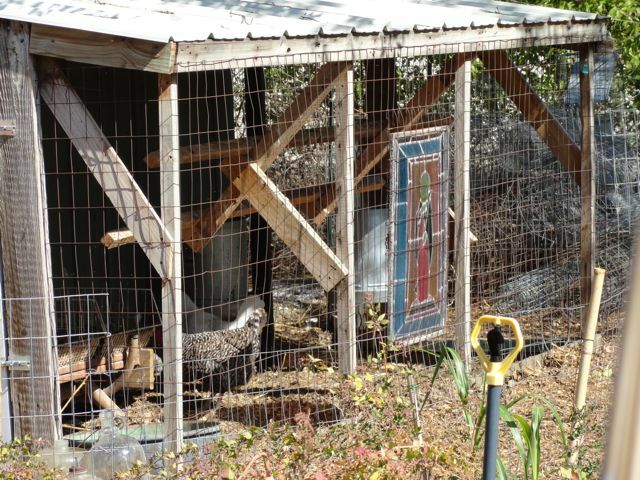 Efficient gardening is letting the chickens do the work so you don't have to. The folks at Urban Patchwork are constantly experimenting with ways to do it better, particularly in these extreme drought conditions. On the Farm tour we were shown drip irrigation, wicking systems – where the garden is watered from the bottom up, aquaponics – hybrid hydroponics/aquaculture system, a compost tea brewer, a hugelkulter spiral garden – raised beds filled with rotting wood, a worm compost bucket and other clever tools and approaches to gardening. 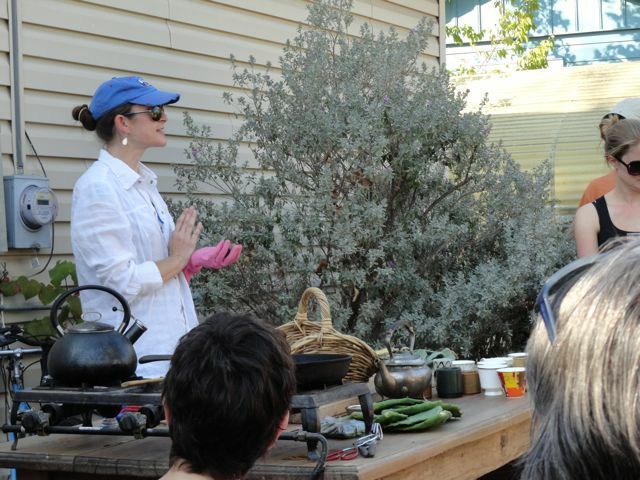 The last part of the Urban Farm tour took place back at the starting farm on Duval where the group gathered around a table to watch a demonstration of yaupon holly leaves being crushed, roasted and made into a tea. If you're a tea drinker, you won't have to go far to find yaupon holly plants in the area. One of the sponsors of the tour was Dripping Springs Vodka. Volunteers helping out with the tour prepared a vodka drink with a prickly pear syrup for the adults to sip while watching a demonstration on how to shave, peel, mash and cook prickly pears to extract the bright purple almost fluorecent juice. At the conclusion of the tour, we were given a virtual goody bag with a napoles pad, a little jar of prickly pear and wild plum jam, yaupon holly leaves, and recipes. It was a great afternoon on the farms. 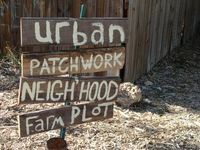 Click here if you would like to learn more about Urban Patchwork Neighborhood Farms and here to find out about Slow Food Austin.